Starting the week of September 6th, CatholicTV will air a new show called My Americas which explores Hispanic heritage and is hosted by two young, Mexican Americans, who travel through Latin America exploring the roots of their Hispanic heritage. CatholicTV will also air a Spanish version of the same show called “Caminanté”. 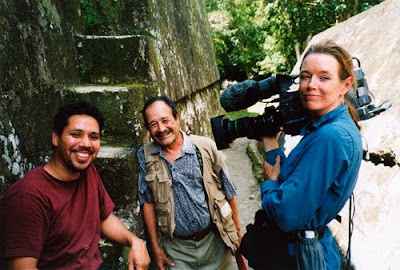 Both My Americas and Caminanté will air at CatholicTV.com and on CatholicTV cable outlets. My Americas is hosted by the ever-popular Roberto Alcaraz and Leticia Vásquez. The program takes viewers from Cuba to Bolivia, Mexico to Puerto Rico, Bolivia and Peru for a close-up look at the diverse spirituality and rich cultures of Latin America. The camera follows Roberto and Leticia as they participate in local rituals, celebrations and spiritual expression. They don elaborate outfits, dance to African drums in Cuba, and around a fire in Guatemala. My Americas exposes English-speaking viewers to the lively and deeply spiritual heritage of the fastest-growing population in the United States. My Americas was funded by Maryknoll Productions and Latino Public Broadcasting. Each Week CatholicTV airs programming in Spanish including a Bi-Lingual Sunday Mass, the Catholic variety show Buena Nueva, Apostolado Hispano Television, which celebrates Hispanic heritage with music, dance, and food. Each week, CatholicTV also airs a Spanish Novena service from Boston’s historic Mission Church Basilica.